Since I cannot find a good classifieds website, I'm putting this on my blog. I have a very nice Black Macbook, model 4,1 (this is the one released just before the unibody one). Bought in September 2008 and rarely used. It's in like new condition. This is the high-end macbook. 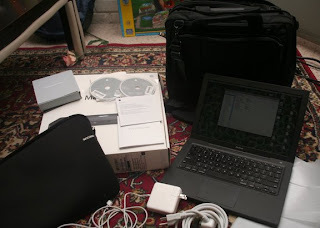 wifi, bluetooth, built-in webcam, firewire, etc. price 800 JD or best offer. let me konw if you'd like to see it. I give you 600 dlls, I am from Texas. can you wait until may because I might want to buy it.